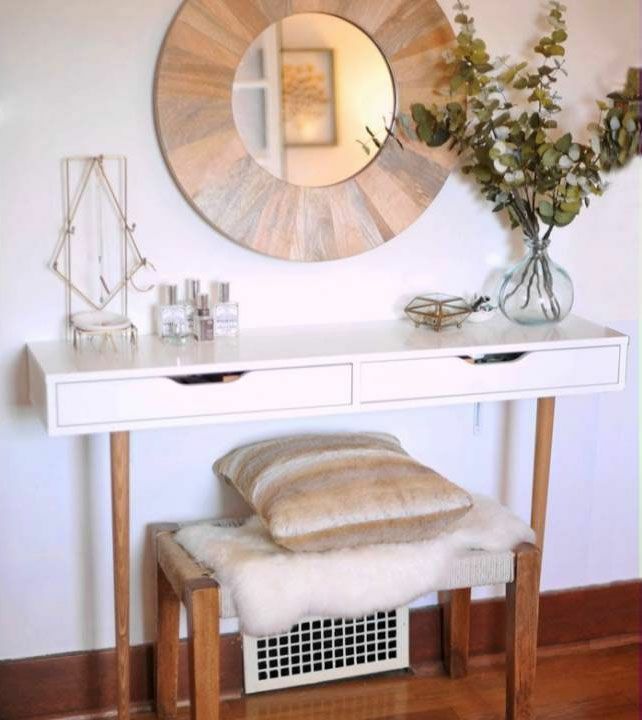 This desk is a great option for small spaces! 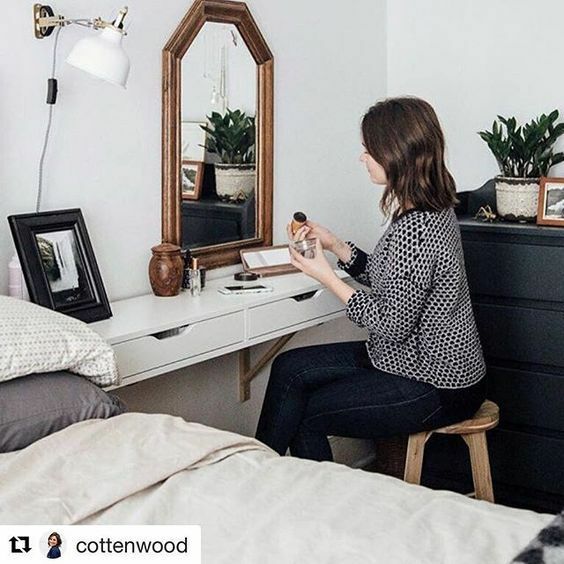 It's handy to tuck in a guest room, makes a great homework desk in a kid's room, and can even do double duty as a nightstand/desk combo if you have the space. 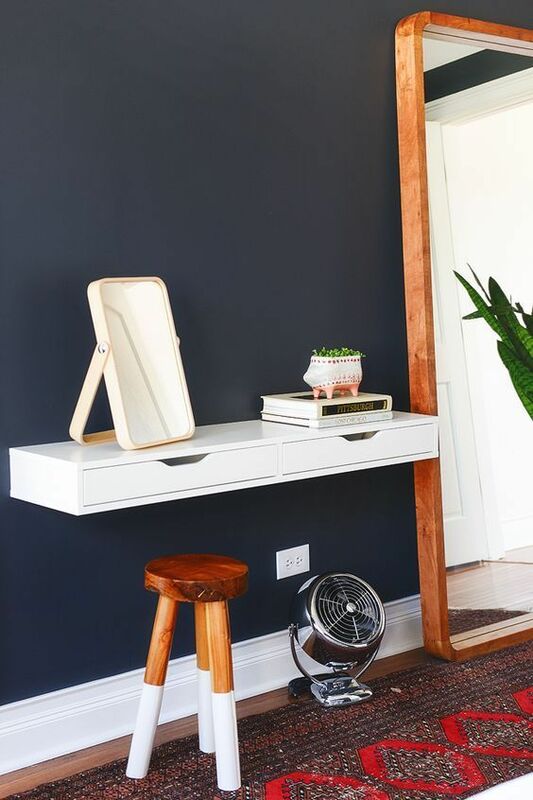 It's narrow frame makes it perfect for mounting on the wall, but we're including a plan for a set of legs to give you a free-standing desk option. You'll also have options for a one-drawer or a two-drawer version to give you double the space-fitting options! 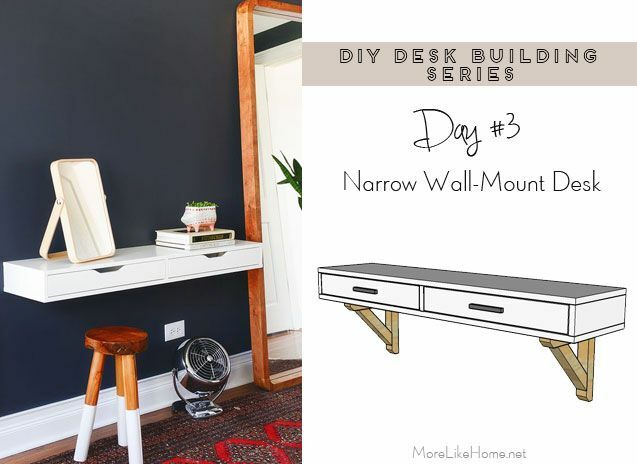 You can also attach the desk to the wall by drilling through the back (into studs!) and add a set of legs to support the front. Any legs 24-25" tall will work! You can find tapered mid-century modern legs like these on ebay, etsy, and at some hardware stores. 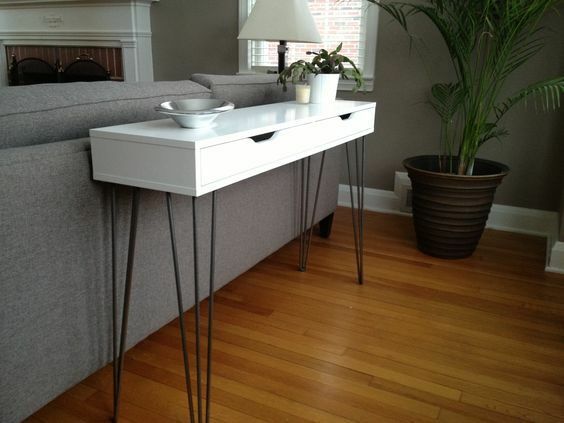 It's also great with a set of hairpin legs! Okay, okay, last one and we'll get to the plans! I'm loving the two-tone white with wood (you'll probably see that theme throughout the series). Also, I based our leg design on this desk. 'K, let's get started. 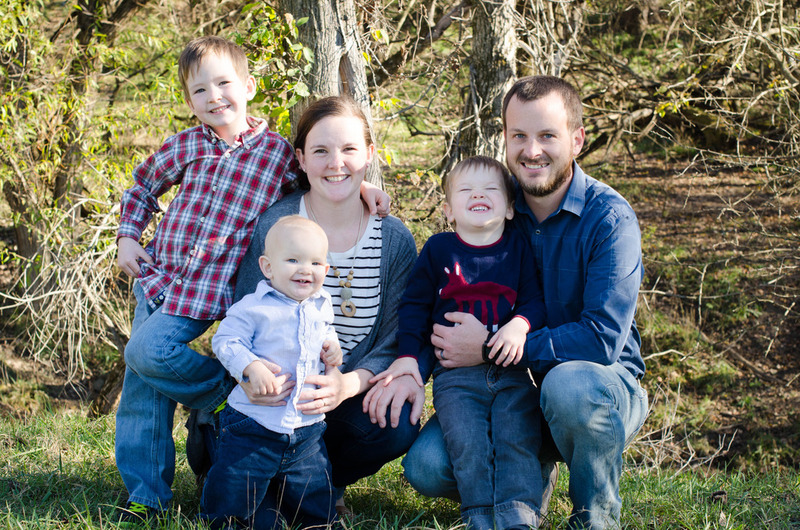 Like yesterday's plan, this one has a few options to choose from! So again there will be a separate shopping list for each item. Take what you need and leave the rest. optional: you can also order sturdy metal brackets like these instead if you don't feel like building your own or want a different look. 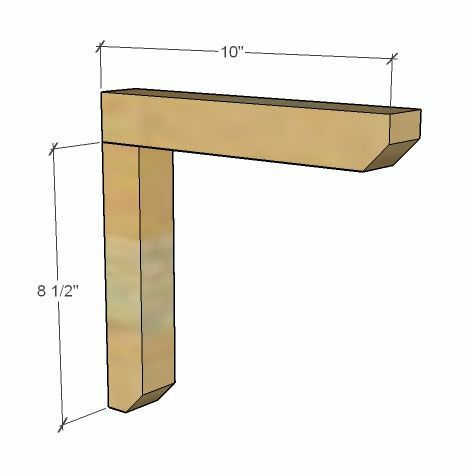 Finished dimensions for the desk box are 48" wide x 11 1/4" deep x 5" high. 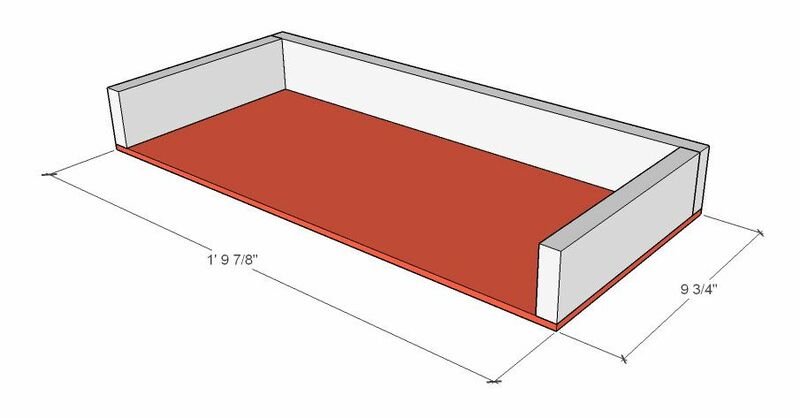 (G) 2 - 1/4" plywood @ 21 7/8" x 9 3/4"
(G) 1 - 1/4" plywood @ 21 7/8" x 9 3/4"
Use a Kreg Jig to attach the sides (B), back (C), and divider (D), to the the top (A). I like the Kreg Jig for this because you won't have any holes to fill in the top, but if you don't have one you can drill down through the top into the pieces to attach them. 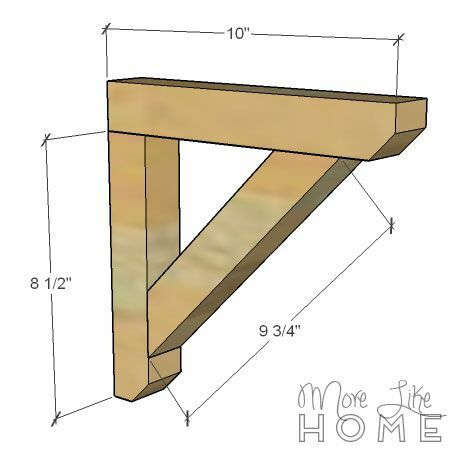 The sides and back should be flush with the sides and back of the top, and the divider should be centered with 22 7/8" on either side. Then attach the bottom (A). For this one you can drill up through the bottom into the sides, divider, and back (no sweat since any holes will be on the bottom). For a super-simple build, you can stop right here and leave the spaces open as a shelf. It's perfect for stashing papers or a laptop off the desk top. 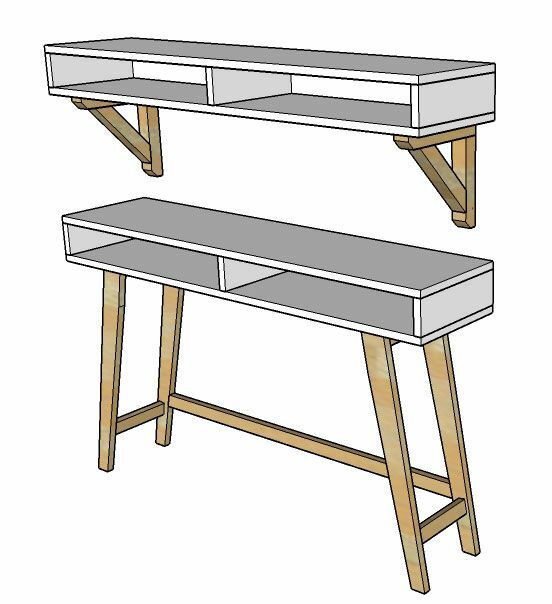 You could even use one as shelf with brackets mounted about your desk for double storage! 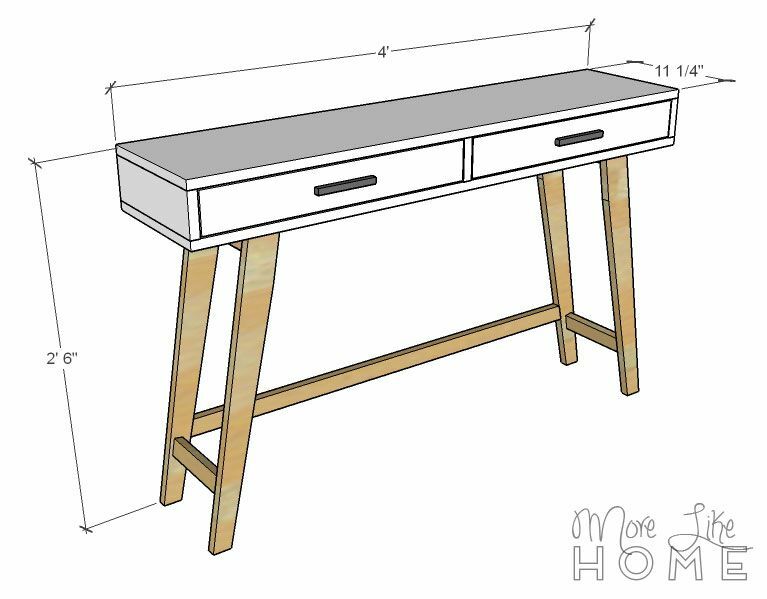 To build the drawer boxes, start by attaching the drawer sides (F) to the drawer back (E). 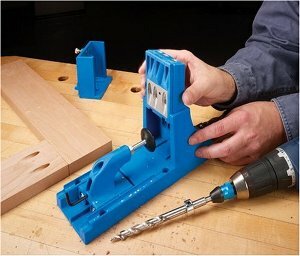 Use a Kreg Jig, or drill through the back into the ends of the side boards. 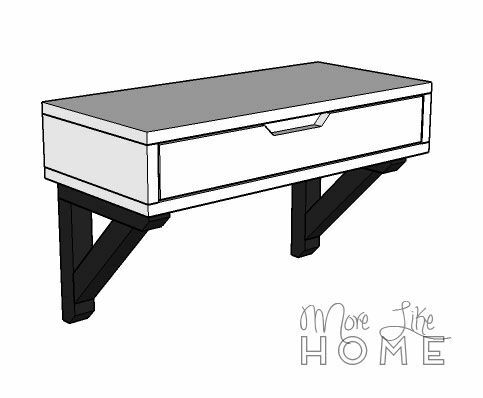 Attach the drawer bottom (G) to the bottom of the drawer frame with 1 1/4" screws. 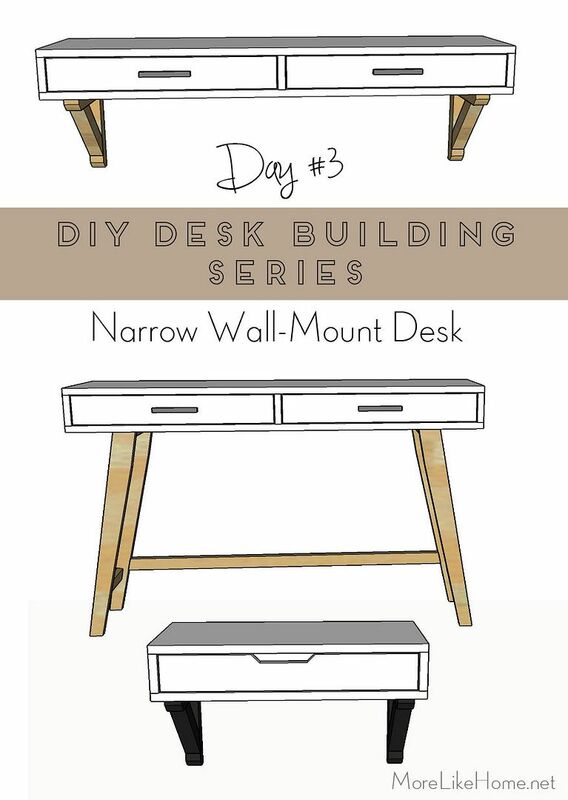 Follow the instructions on your drawer slides to install the drawer boxes into your desk. 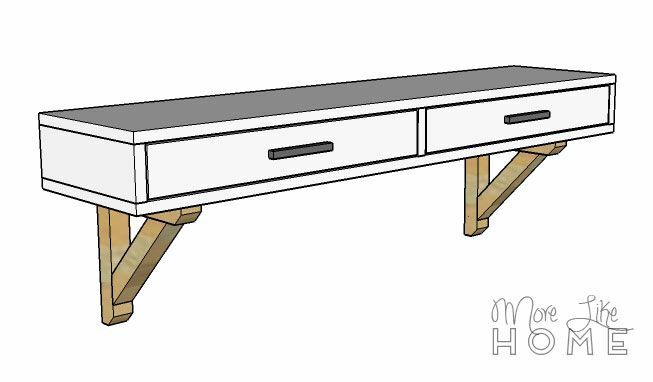 Optional: for a modern look you can cut a notch handle into the drawer fronts. 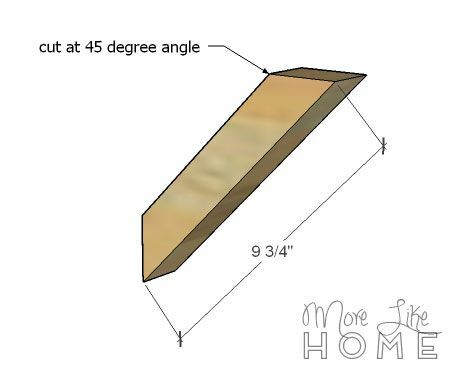 Measure in 9" from each side, and cut out a notch 3/4" deep between those marks. Center a drawer front on each drawer box, with a 1/8" gap around the drawer front. Attach it to the drawer box with finishing nails (you can reinforce this with the Kreg Jig for a stronger hold). Attach the bracket top (I) to the bracket back (J). 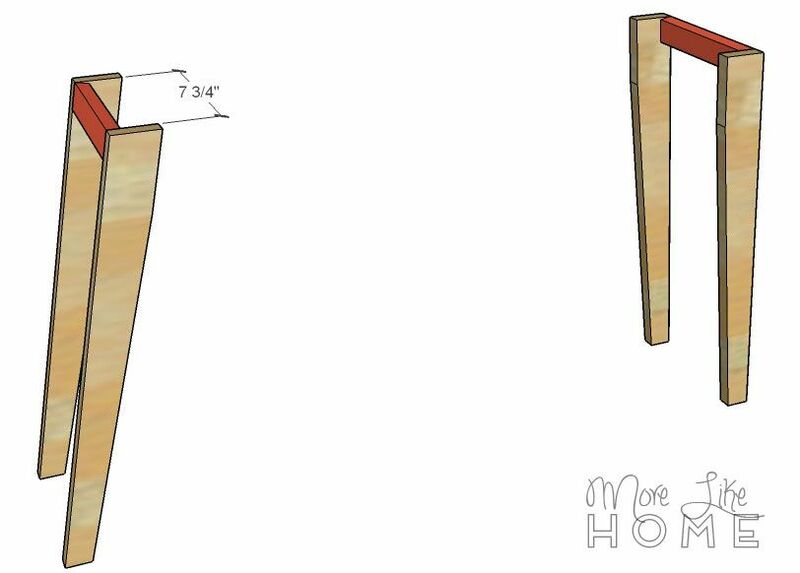 You can use a Kreg Jig with 2 1/2" pocket hole screws, or drill down through the top into the back with 2 1/4" screws. You can cut off the front corners of the boards for a neater look. Cut the ends of the support (K) at a 45 degree angle. Attach it to the bracket with the Kreg Jig or by drilling through the support into the top and back boards. Repeat to make the second bracket. You will need two brackets for each desk. 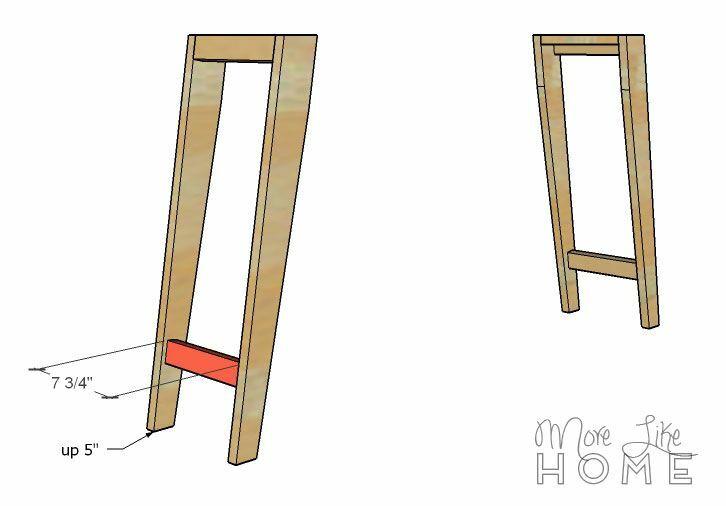 Make sure you anchor the brackets into studs, or use really good anchors to hold the weight. 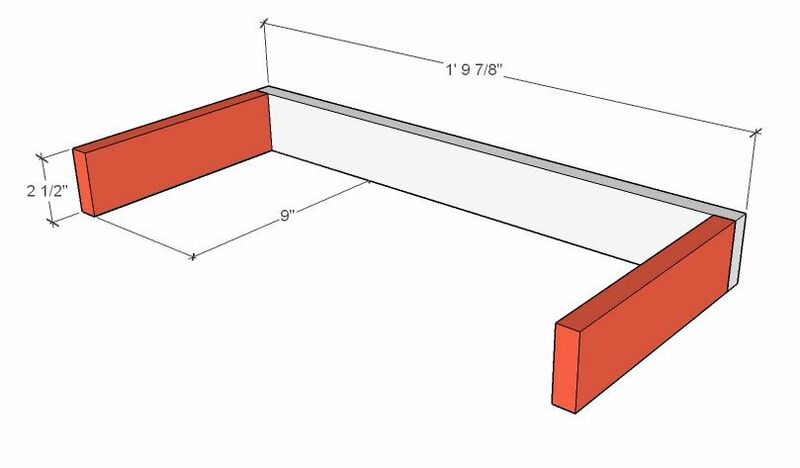 It may be easier to assemble the top and back, then attach the bracket to the wall before you install the support board. Be sure you screw it to the desk, too. 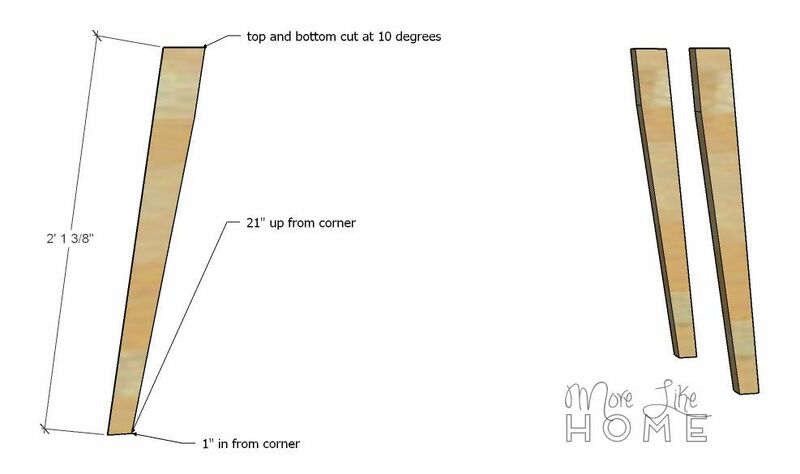 Start by cutting the top of the leg (L) at a 10 degree angle. Measure down 25 3/8" from the short side and make a mark. Cut on the mark at a 10 degree angle, making sure the cut ends are parallel. 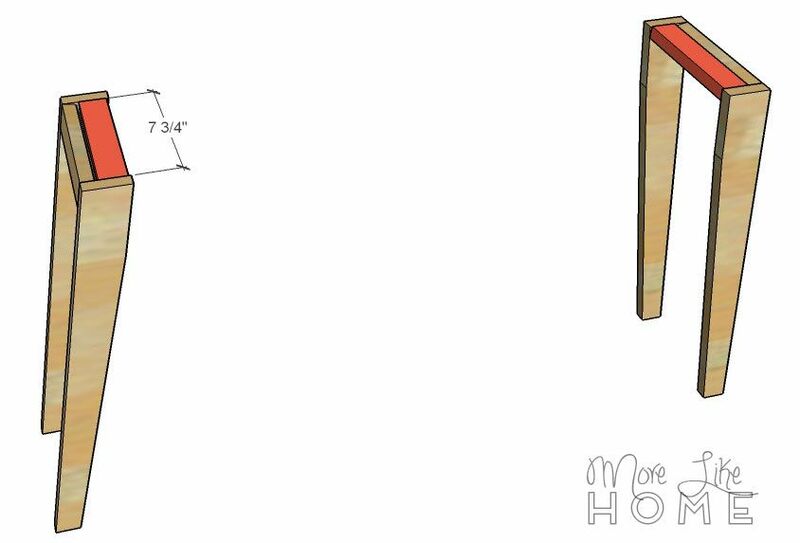 Optional: You can taper the legs with a circular saw to give your desk a lighter feel. 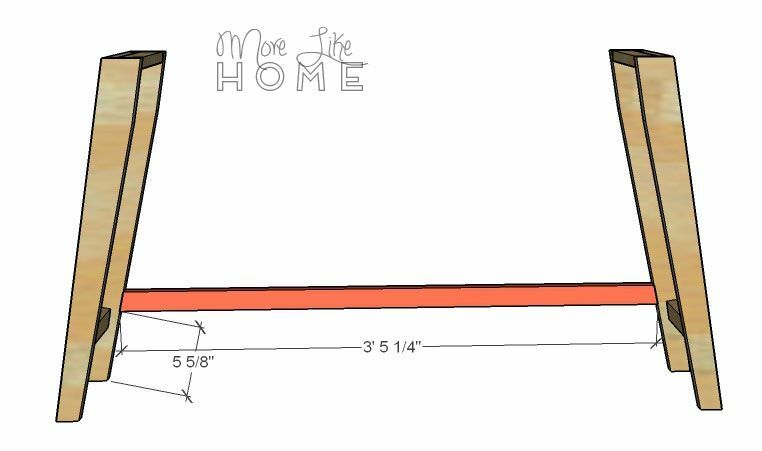 Measure in 1" from the bottom inside corner of the leg, then measure up 21" from that corner. Drawer a line connecting those two marks and cut along the line. Install the first two trim pieces (M) between a pair of the legs. It should be flush with the top and outside edges of the legs. Use a Kreg Jig, or drill through the legs into the ends of the trim. Install another trim piece next to that piece, lying flat and flush with the top edge of the legs. You'll use these pieces to attach the legs to the top. The last pieces connect the bottom ends of the legs. They are set up 5" from the floor, and inset slightly from the outside face of the legs. Use the stretcher to connect the two leg pieces. It should be set up 5 5/8" from the bottom of the legs. Use the Kreg Jig, or drill through the legs into the ends of the stretcher with 2 1/4" screws. 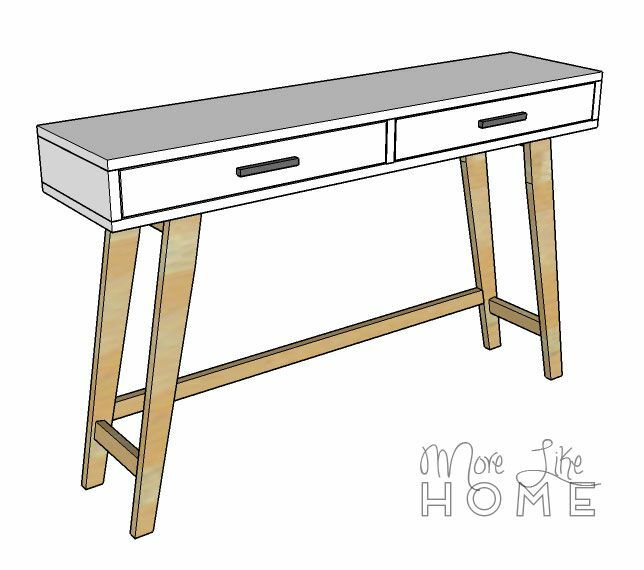 Attach the desk to the legs by drilling up through the flat trim pieces into the bottom of the desk. Don't countersink these screws, you don't want them poking all the way through the bottom of the desk! 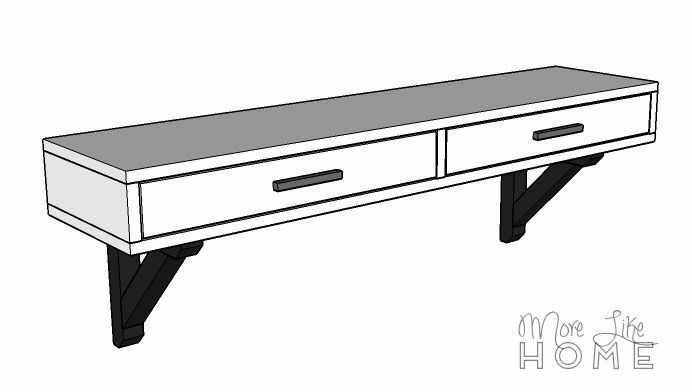 You can make a set of legs for the single drawer desk by shortening the stretcher, but you won't be able to get a chair under it. It would still work great as an end table or nightstand, though! 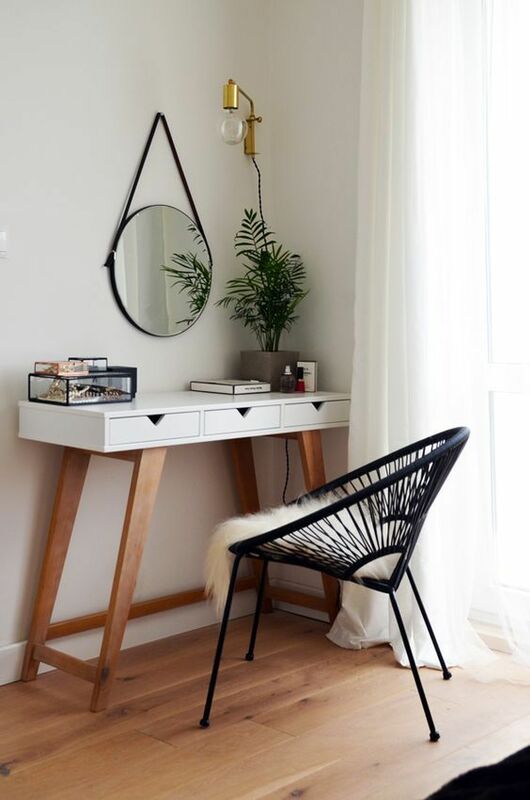 And here's a last inspiration photo for a nightstand/desk combo! This is what I need in our family room! And I looooove that one in the bedroom! Me too! That's what I want my house to look like.